Following on from the success of the mobile app, which has quickly become the Institute's most popular application on the Android platform, the ICS team have taken it a step further and made Buntata available via a website that can be accessed from any device running a recent version of a web browser. Buntata Web employs modern technologies to ensure the web version closely resembles the main Android app, helping experienced users of the app feel at home. Additionally, the responsive layout ensures Buntata Web works on all devices from mobile phones to desktop PCs. The web app is not meant to be a replacement for the Android app – they sit alongside and complement each other. Some of the features that the Android version of Buntata provides such as the ability to track images based on GPS coordinates are not yet available on Buntata Web, but the team are hoping to add them soon. Buntata’s use is not just limited to researchers or farmers. 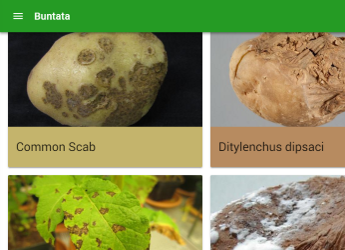 Anyone who grows potatoes - be it in large scale on a field, or in their back gardens - can learn to better understand potato pests and diseases, their cause and how to prevent them. Buntata Web is available on the Institute's Information and Computational Sciences group website and the Buntata Android app can be downloaded from Google Play.